Given that we’ve needed to rely on email a lot as I’m in Denmark and you’re near London, perhaps we just continue in the same way with our creation story? OK, so we met up in London, joining all the other teams wondering what words they would get. I knew our letter – ‘X’ – but I was wondering what would turn up. X-ray? Xylophone? My reaction? I will never remember this word! It seemed pharmaceutical or altogether made up. This actually came from a lovely typeface you showed me in your studio, which had little star elements. It got me thinking about ancient Greece and astrology and trying to match it together with xenium / hospitality. So immediately there was this play between the words and the visuals. All of which brings us to your trip to New York…. My little typeface is officially called Snowburst but I always think of it as Starburst…. 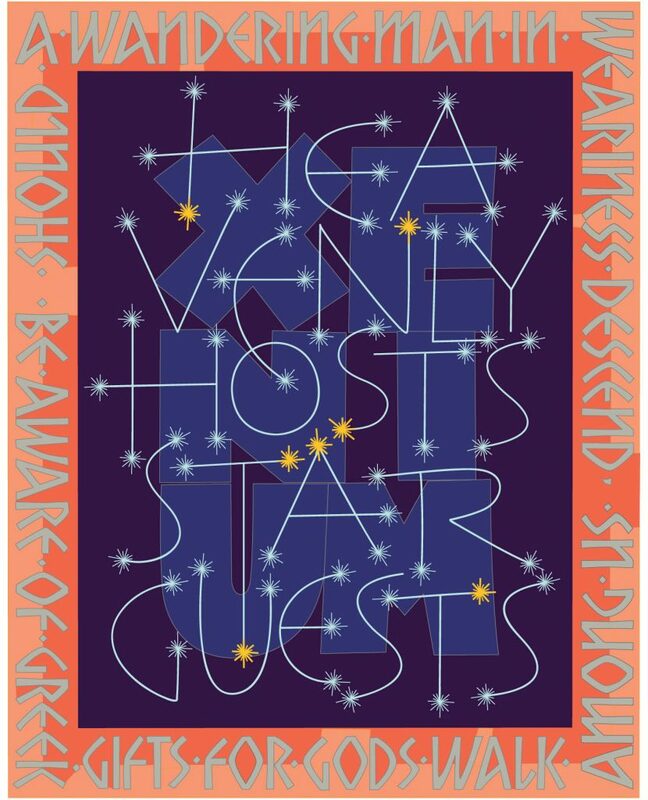 I loved the ‘Heavenly Hosts, Star Guests’ phrase. It summed up xenium and all the connotations in the ancient world, but it also very much put me in mind of Elton John with all his sparkling glitter! And yes, my epic trip to New York – a special trip with Christopher my son! While there, I was much taken with the mosaics in the subway stations. So, given our ancient Greek researches, it got me wondering how to incorporate this into our piece. Maybe a mosaic border to surround our Heavenly hosts…? Right, New York subway inspired mosaic border. But what to say? This last bit was because we’d discovered that ancient Greeks always needed to have a gift for strangers at home – actual xenium! – just in case a god came by in disguise (seems kinda tricksy but they did that, apparently). Yes the border was rather fun as I did not really know what I was doing at first! I’d decided to use the project to learn the Adobe Illustrator program; although for a long time I wanted very much to find a way to carve it – still do! The mosaics were simplified into 2 colours, and I had to decide where the division was – except that somehow the program did that for me (real serendipity) and then I adjusted. But the border with just that one phrase became really huge – such large letters – so we needed to add some more words. Remember how difficult it was to keep the ‘Ps and Qs’ out? You worked so hard to pack our piece with all these ‘secret’ meanings and references. Orion is a great example – hidden in plain sight in the typographic firmament! 26 is a not-for-profit collective of writers. Our members include writers of all kinds: business writers, poets, novelists, copywriters, screenwriters, anyone with a love of words. Letter Exchange is a group of skilled professionals representing the full range of lettering disciplines from typography and font design to calligraphy and letter cutting.